The Wendel lab pursues disease-centered and basic discovery research in cancer. Our disease focus is on the genetic pathogenesis of deadly forms of B cell malignancies. Our basic discovery work explores aberrant mRNA translation programs across different cancers. The overarching goal of our work in both areas is to translate new insight into cancer genetics and biology into future therapies. Work in the lab includes the full range of molecular biology tools, genome editing, and in vivo modeling, and therapeutic studies. Excellent collaborations with academics and industry further expand the scope of our work and fuel new strategies. We are always looking for talented trainees at all levels. See Career Opportunities for details and requirements. 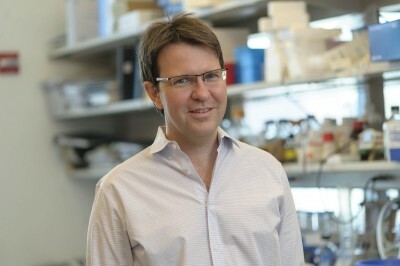 Cancer biologist Hans-Guido Wendel pursues both disease-centered and basic discovery research. The disease focus is on lymphocyte malignancies and the basic science arm of the lab explores fundamental mechanisms that control aberrant mRNA translation programs in cancer. Work in these two research areas frequently intersects in surprising ways. Oricchio E, Nanjangud G, Wolfe AL, Schatz JH, Mavrakis KJ, Jiang M, Liu X, Bruno J, Heguy A, Olshen AB, Socci ND, Teruya-Feldstein J, Weis-Garcia F, Tam W, Shaknovich R, Melnick A, Himanen JP, Chaganti RS, Wendel HG. The Eph-receptor A7 is a soluble tumor suppressor for follicular lymphoma. Cell. 2011 Oct 28;147(3):554-64. doi: 10.1016/j.cell.2011.09.035. Generation of CAR-T cells that produce anti-tumor proteins (“Micro-pharmacies”) (Cell 2016). Identification of the HVEM – BTLA interaction as a major failsafe mechanism against lymphoma development (Cell 2016). Characterization of the key epigenetic regulators in lymphoma biology (MLL2/KMT2D and CREBBP/EP300) (Nature medicine 2015, Cancer discovery 2016). Identification of an eIF4A dependent mechanism that controls the translation of G-quadruplex containing mRNAs including oncoproteins (Nature 2014). Development of a rational combination therapy for high-risk follicular lymphoma (Journal of experimental medicine, 2014). Generation of a cell engineering strategy to enhance the safe use of stem cells for therapy (Cell reports, 2014). Identification and therapeutic delivery of the soluble tumor suppressor EphA7 in lymphoma (Cell 2011). Identification of MNK kinase as a cancer drug target (Genes & development 2009).